Don McGee: In Psalm 22:6, the psalmist shifts from the Messiah's spiritual suffering to His physical and emotional distress. Verse 6 reads, "But I am a worm and not a man, a reproach of men and despised by the people. All who see me sneer at me; they separate with the lip, they wag the head, saying, 'Commit yourself to the Lord; let Him deliver him; Let Him rescue him, because He delights in him.'" The Hebrew word translated "worm" in verse 6 is tola, it's the word for crimson or scarlet. It is also a word for a certain type of worm. In this context it is most likely referring to the bloody red condition of the Messiah after His flogging, when He would have been so mutilated and swollen that He would no longer even resemble a man and would be an object of derision. We find the fulfillment of this prophecy in Matthew 27, "And those passing by were hurling abuse at Him (Jesus on the Cross) wagging their heads, and saying, 'You who are going to destroy the temple and rebuild it in three days, save Yourself! If You are the Son of God, come down from the cross. In the same way the chief priests also, along with the scribes and elders, were mocking Him, and saying, 'He saved others; but He cannot save Himself. He is the King of Israel; let Him now come down from the cross, and we shall believe in Him.'" Don McGee: This brings us to verse 9 of Psalm 22. In this verse and the one following, the psalmist has the Messiah reaffirming His faith in the midst of His intense sufferings. Verse 9, "Yet, You are He who brought me forth from the womb; You made me trust when upon my mother's breasts. Upon You I was cast from birth; You have been my God from my mother's womb." Dr. Reagan: It reminds me of the tough faith of Paul. You know, when he was in prison in Rome, awaiting execution, Paul wrote in the Philippian letter, "Rejoice in the Lord always; and again I say, rejoice!" He proceeded to urge his fellow believers to "be anxious for nothing, but in everything by prayer and supplication with thanksgiving let your requests be made known to God." He then revealed the secret of his positive attitude in the midst of suffering. He wrote, "I can do all things through Him [through Jesus] who strengthens me." 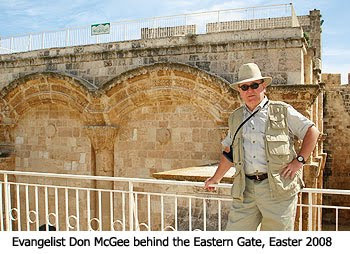 Don McGee: In other words, Paul was saying that we should keep our eyes focused on the Lord rather than upon our troubles, and, as he put it, "the peace of God, which surpasses all comprehension, will guard our hearts and your minds in Christ Jesus."